Emerging economies with robust economic growth remain a significant opportunity for companies eager to grow and expand their business. With growth opportunities limited in the U.S. and Europe, these countries will be the battleground for companies in the years to come. Asian companies have improved their skills and practices and are gaining in their ability to produce reliable products. Lean approaches have progressed globally and emerging markets are no exception. However with all the opportunity and cost advantages, emerging market economies such as China, India and Vietnam present some unique challenges for companies eager to run the same lean production and logistics that they run in the U.S. and Europe. Some companies question if the same lean practices can be successfully implemented in emerging markets. Other companies are discovering that lean manufacturing and logistics are not only a possibility, but increasingly essential for business success. What is a lean? Lean manufacturing is a management process derived mostly from the Toyota Production System (TPS). A lean process (or system) is designed with a focus on customer value and satisfaction. Its aim is to deliver a product to the end customer quickly and efficiently with minimum waste in the system while delivering superior financial returns to the business. Implementing a lean approach in emerging markets can be a challenging, but possible undertaking for companies. It is important to note that lean principles do not apply only to manufacturing, but also to areas such as logistics and retail. For most companies in emerging markets, this is still a relatively new area. However some companies are already applying a number of lean principles. Cultural Challenges In a lean organization, the lean manager fulfills the role of an active problem solver. Traditionally, in emerging cultures, that is the responsibility of the manager. Workers and supervisors are not called upon for advice. Instilling a culture of problem solving takes time, and requires a major shift in the organization. One of the most difficult challenges is to change the behavior and convince staff and managers of the value of lean approaches. Changing the mindset of employees is critical to success, and companies must ensure groups do not view each other as rivals, but rather as team players. Companies need to ensure that all communication channels are open. For example, when Schneider Electric SA in Peru identified communication challenges between managers and employees, the plant established a communications council to address topics such as customer-service issues and cross-functional communication. Today Schneider Electric SA is viewed as a model for lean implementation in emerging markets. Beyond opening communication channels, companies need to invest significant resources in training. The “small” challenges In many Asian economies, most products are sold primarily through small shops after being delivered by small third party distributors. Orders are normally much smaller and customers require more frequent delivery than developed markets. With limited technology and visibility in outlets, applying lean principles can be a challenging undertaking. However, even in small retail shops and distribution centers, companies can assist distributors and retailers to apply lean principles. Companies can help partners to simplify processes and systems and importantly help to reduce lead times. Companies can work with local distribution partners to identify value adding and non-value adding activities. Even in operations with limited technology and manual processes, this is a possibility. 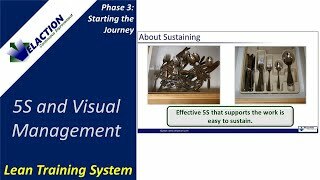 Companies can work closely with distributors to implement systems such as the five s’ (5s: sort, straighten, shining, standardize, and sustain) and to help create visual management tool. In emerging markets, where literacy is sometimes a problem, implementing visual processes and flows can be hugely beneficial to employees. Implementing systems such as the 5s will reduce or even remove the clutter and bottlenecks that so often plague local operations. Companies can work with partners to provide clear instructions and process flows and in the process realize significant supply chain cost savings. Such lean practices require limited investment and can go a long way in creating a leaner supply chain. The importance of training In emerging markets readily available lean skills in the market are limited and companies need to invest time and money in capability development. In countries with high staff turnover such as China and Vietnam, identifying employees that are dedicated to the job ahead, can also be challenging undertaking. To implement lean principles, such as continuous improvement, requires discipline and companies need to invest in continual mentoring, coaching, and training of lean mangers. Companies are making use of a number of training options including training centers, universities and institutes, such as the Lean Enterprise Institute. Training centers can help companies to build the required capability in the organization and ensure employees understand key lean principles. They can further help the company to create a continuous improvement road map and track employees to ensure they are on the right path to lean success and personal career development. For most companies, most lean roads lead back to Toyota. The same is true of emerging markets, where Toyota has played a key role. During the Asian financial crisis in the 1990s, Toyota implemented an aggressive emerging market strategy to take advantage of low cost labour and emerging market cost advantages. One of the key challenges was how to implement the same lean production principles they had in Japan, in emerging economies. Toyota was concerned with quality and whether local staff, with a lack of experience and tradition in manufacturing excellence, could implement the same lean principles. Toyota embarked on an ambitious program that invested heavily in training and skills development in these markets. Today, Toyota is reaping the rewards, and remains the exemplar for implementing lean production. Still, to apply lean techniques in emerging markets, companies need to accept compromises or trade-offs as not all lean principles will be successful. Suppliers in emerging markets typically are not as reliable. Implementing just-in-time can be challenging. It is, however up, to companies to determine which lean practices are realistic and which are longer term goals. Companies that overlook the softer side of implementation will struggle. Change in emerging markets can sometimes take longer, and companies need to focus significant resources on creating the right organizational culture and building capability within the organization. However, with the right approach, leaner operations can be a reality.